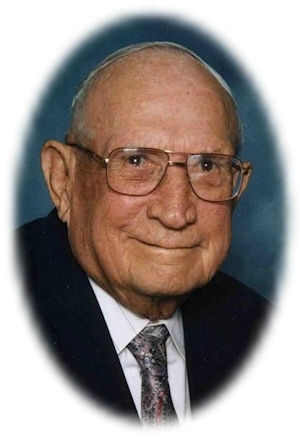 Obituary – Sherrard, David Sylvester « Perry High School Alumni Association, Inc.
David Sylvester Sherrard, 84, of Perry, Oklahoma was the son of Ralph Edwin and Martha Almira Aten Sherrard. He was born October 18, 1920 southeast of Perry, Oklahoma and died on Sunday, January 16, 2005 at the same home southeast of Perry, Oklahoma. He was a 1938 graduate of Perry High School and served in the U.S. Coast Guard from March, 1942 until September, 1945. David and the former Mary Ann Hensley were married May 5, 1944 at Edmond, Oklahoma. He was an avid farmer for over 40 years until retiring in 1983. He was of the Southern Baptist faith and was a member of the First Baptist Church of Perry for about 80 years. At the time of his death, David was a member of the First Baptist Church of Stillwater. He enjoyed family gatherings, spending time with his dogs and fishing. Funeral services will be at 1:00 p.m. Wednesday, January 19, 2005 at the First Baptist Church at 701 S. Duncan in Stillwater, Oklahoma. Graveside services will be at 3:00 p.m. Wednesday, January 19, 2005 at Grace Hill Cemetery in Perry, Oklahoma. Rev. Bobby Lee and Rev. Matt Miles will officiate. Services will be under the direction of Brown-Dugger Funeral Home of Perry, Oklahoma. Memorials may be made to the Keenagers Senior Adult Sunday School Classes of the First Baptist Church of Stillwater in care of Brown-Dugger Funeral Home. David is survived by his wife, Mary Ann, two sons, Larry David Sherrard and his wife, Sue, of DeLeon, Texas, and Ralph Marion Sherrard and his wife, Charlene, of Moore, Oklahoma; five grandchildren, Bill Sherrard and his wife, Gina, of Rhome, Texas, Brian Sherrard and his wife, Teisha, of DeLeon, Texas, Bobbette Walker and her husband, Rich, of Fort Worth, Texas, Kevin Sherrard and his wife Sarena, of Oklahoma City, Oklahoma, and Kim Dietrich and her husband, Duane, of Jenks, Oklahoma;and four great-grandchildren, Samantha Sherrard, of Natchitoches, Louisiana, Jacob Wadley, of Fort Worth, Texas, Joshua Wadley, of Fort Worth, Texas, and Sarah Sherrard, of Oklahoma City, Oklahoma. His parents, Ralph Edwin and Martha Almira Sherrard, one sister and brother-in-law, Virginia and Clair Goss, one brother and sister-in-law, Grant and Jewell Sherrard, and one nephew, David Goss, preceded him in death.